Pocket Pitbulls are fast becoming a popular choice of pet, particularly with those who want a Pitbull but are put off by the idea of owning a large dog. This crossbreed comes from a mix of the American Pitbull Terrier and the Patterdale Terrier. Since they look more like the Pitbull parent, they are usually called either Pocket Pitbulls or Miniature (or Mini) Pitbulls. So why are these dogs all the rage, and what else should you know about them? 5. She’s a looker… and low-maintenance! Mini Pitbulls inherit their short stature from their Patterdale parent. They usually grow to between 12 – 16 inches (30.5 – 40.5 cm) tall. If they grow any taller than this, they are simply considered a Pitbull mix. 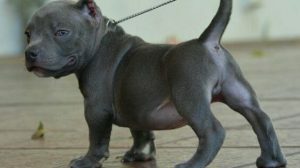 Bear in mind, though; Miniature Pitbulls are still muscular and strong. They can weigh between 11 – 22 pounds (5 – 10 kg), so don’t kid yourself thinking this dog will be light as air and easy to train to walk on the leash. They may be small, but boy can they go. It figures – this is a cross between two very active, working breeds. The American Pitbull Terrier was bred for its strength and athleticism and used as a hunting dog, while the Patterdale Terrier was bred to be a “tough as nails” hunter of ground-dwelling animals. Between the Patterdale’s playfulness and the Pitbull’s gentle “nanny dog” nature Pocket Pitbulls make great companions for children when properly trained. I wouldn’t recommend these dogs for very small children, however, as they are strong, active dogs – a boisterous young puppy could easily knock over a very small child. The Mini Pitbull takes after its Patterdale parent in that she is usually a very good watchdog and will bark to alert you of an intruder. This instinct comes from a strong desire to protect their territory and their family. This dog’s coat makes her quite the looker. It is incredibly shiny and smooth and can be white, cream, tan, brown, black, or gray. Since these dogs are considered “designer dogs” and they are rarer to come by than purebreds, they are much pricier. So, if you want a Pocket Pitbull, you’ll have to be prepared to pay a little more than you would for a purebred Pitbull. While a purebred Pitbull usually costs about $500, you can expect to pay between $1500 – $2500 for a Miniature Pitbull. Unfortunately, there are always irresponsible breeders out there, and you have to be really careful when there’s a lot of profit involved as there is with this breed. If you can’t find someone this way, it’s worth having a look on AKC Marketplace. Here you can search for the breed you want and read in detail about the breeder as well as view photos of the puppies. This condition can occur in Pitbulls and causes low hormone levels, leading to lethargy, weight gain, and a dull coat. This condition, common in Pitbulls, involves abnormal growth of the hip joint, which can lead to pain and even lameness, usually in a dog’s senior years. Diet and lifestyle can certainly help towards alleviating this condition. There are also dog foods specifically designed to promote joint health, which usually include glucosamine and chondroitin as well as high levels of omega-3 oils. You can feed lower amounts of these nutrients to a younger dog to keep her joints healthy, while an older dog already suffering from joint pain can do well on a food with higher amounts. Omega-3 fatty acids can also help dogs with heart disease. Look out for foods with fish or flaxseed oil, as these are rich in omega-3s. This cannot prevent the condition, however. Miniature Pitbulls can suffer from a number of different eye problems, most of which can be painful, and some can even cause blindness if not treated on time. This dry, itchy ailment comes from the Pitbull side and usually affects their belly, ears, feet, and the folds of their skin. It can occur due to flea allergies, seasonal allergies, or food allergies. Pocket Pitbulls are becoming popular additions to households across the US, and more and more people are considering owning one. So, it’s important to be aware of what to expect from these dogs. Mini Pitbulls aren’t teacup size as you might expect – they are small but still very muscular dogs that look much like a Pitbull. Despite their small size, they have high energy levels and require lots of exercise and play. They are much more expensive than a purebred Pitbull, so you should be prepared to spend more, and always make sure the breeder is responsible.